It’s been a busy week at the COASST office, with juvenile common murre wreck reports in two Humboldt locations and lots of data coming in! 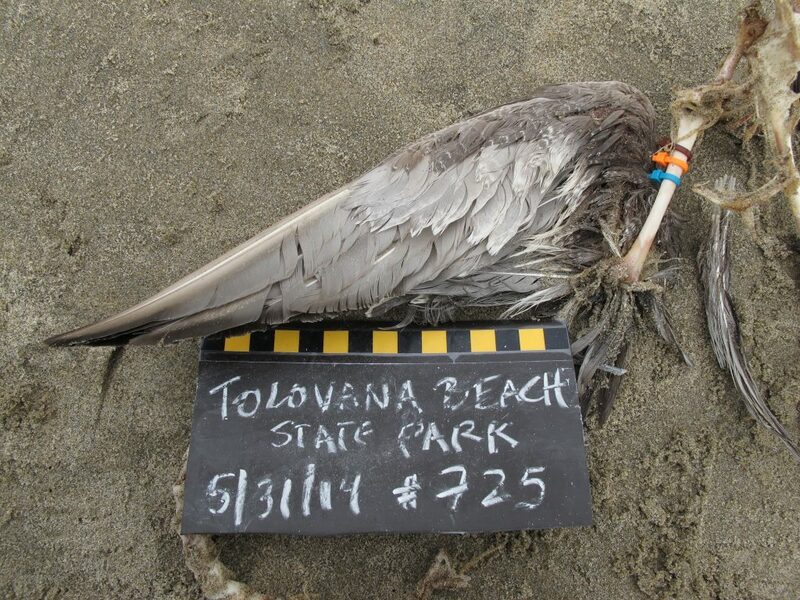 If you happen to see 10 or more beached birds of the same species on your survey, check out Part 4 of the COASST Protocol and let us know if you have any questions about wrecks! We’re happy to help. This weekend we have another low tide series, which means it’s a great time to head out for another sea star survey or your very first, if you haven’t tried the sea star protocol yet. 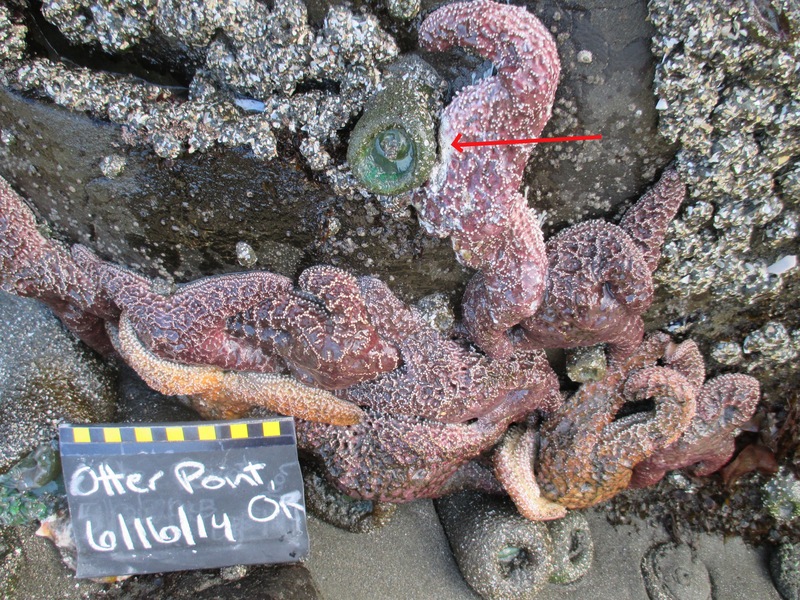 More than 18 species of sea stars in the Pacific Northwest are exhibiting signs of Sea Star Wasting Disease, and we could really use your help to monitor sea stars on COASST beaches. Thank you again to those of you who have contributed thus far. There is no way we could monitor such a large geographic area without your help. 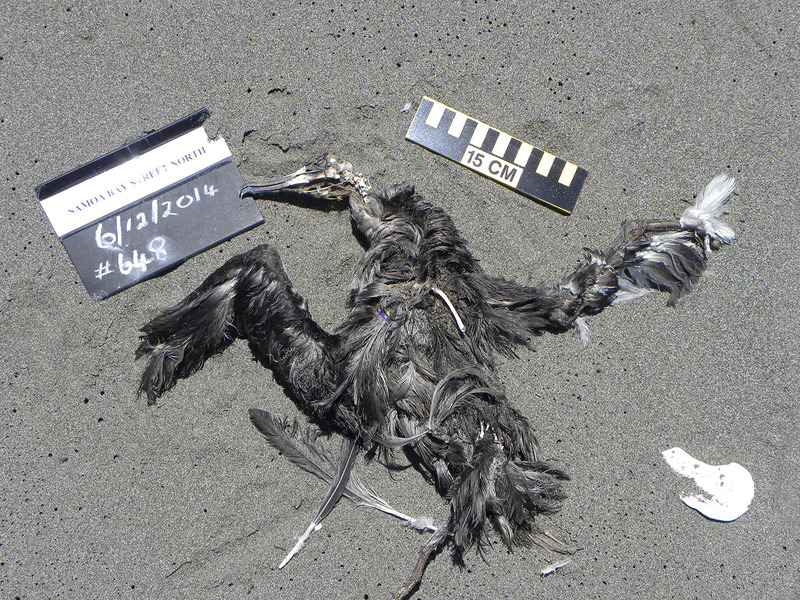 We’ve had quite a few interesting finds on COASST beaches recently, including what we call a one-in-a-million bird! What does that mean? Let’s take a look at what’s washed in and find out! 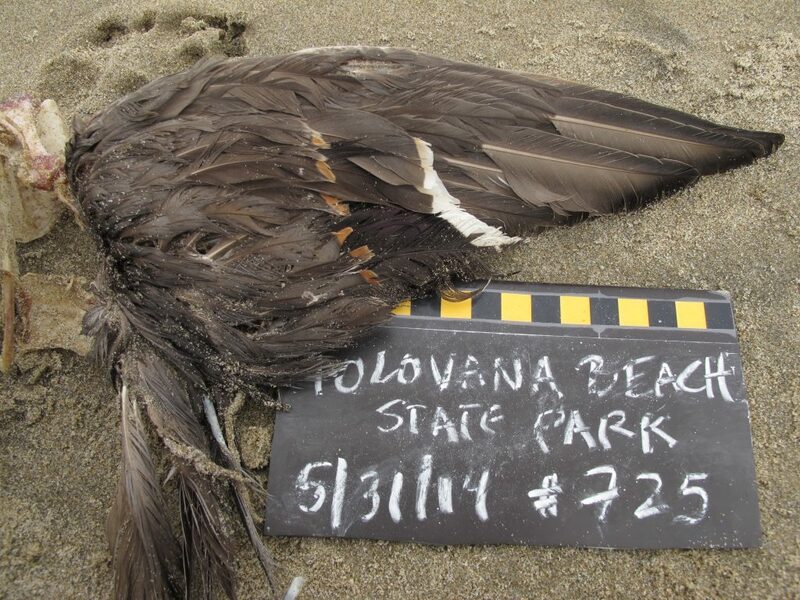 We haven’t seen a flood of this species hit the beaches like what we saw in the summer of 2011 and 2012. Still, Brenda and Bill spotted one – only measurable part left is the tarsus. Let’s take a look, starting with the foot key (tarsus = 53mm): Webbed, go to Q2; completely webbed, go to Q3; 3-webbed, 4th minute (=tiny) go to Q6; thin toe or nail only go to Q7; heel is flat, go to Q8; with this tarsus, we’re at Tubenose: petrels – stop! On TN1, we can see that what’s left of the wings is larger than 20cm, so proceed to True Petrels. Bill is thin, long and dark – one of the shearwaters! With a 53mm tarsus, we’re outside the range of the Short-tailed Shearwater, and just barely in the range of the Pink-footed Shearwater. The PFSH has a pale bill base – well, Sooty Shearwater it is! BJ and John found a one-in-a-million bird last week, not by species (we’ll get to that) – it was oiled AND entangled – only about a .002% chance of that! Let’s get back to what it is – crack open the foot key again: Webbed, go to Q2; completely webbed, go to Q3; 3-webbed, 4th minute (=tiny) go to Q6; thin toe or nail only go to Q7; but this time the heel is swollen: Larids – stop! Hooked bill, mottled brown plumage, dark bill: we have ourselves a Large Immature Gull, specifically a Glaucous-winged Gull, subadult. Look at the size of that fish! 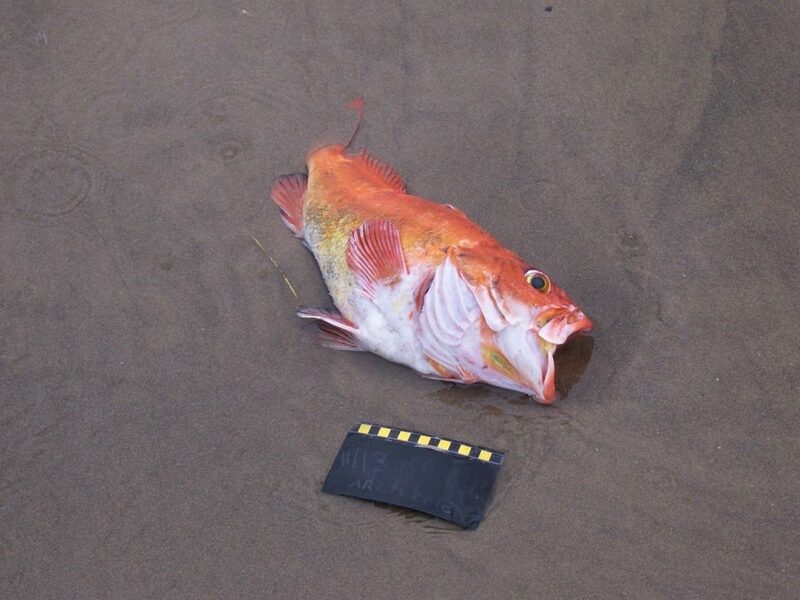 Joanna didn’t find any birds on her Oregon Mile 309 survey, but she did spot this Yelloweye Rockfish (aka Rasphead, Red Snapper) on May 25. Yelloweye range from Prince William Sound, Alaska to Baja California, Mexico, though in the middle of their range, their population is low and declining, which led to a ban on their take in Washington since 2003. In 2010, they were listed as Threatened under the Endangered Species Act prompting a proposal of critical habitat in the greater Puget Sound/Georgia Basin in 2013 for Yelloweye, and two other species: Canary Rockfish, and Bocaccio. Yellow eyed rock fish can grow up to three feet in length. Yelloweye rock fish are red in color as juveniles and very slowly progress to a dull yellow. By very slowly, I really mean very slowly! These fish can live up to about 120 years! 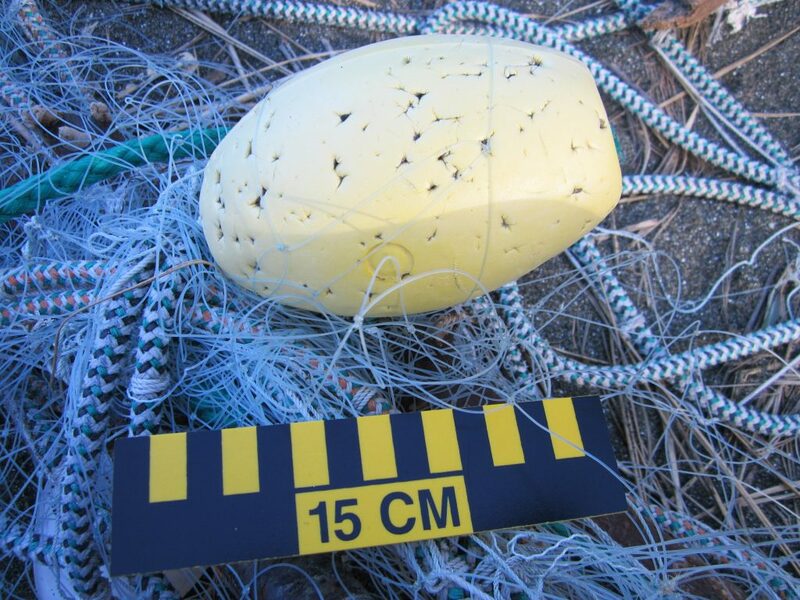 Wondering what’s happening with marine debris? COASST’s Executive Director, Julia Parrish, recently took a trip to Kayak Island, Alaska to test out the marine debris protocol. She was joined by Ellen Lance, Branch Chief for the Anchorage USFWS Endangered Species Program, and they found a lot of BIG debris. On the smaller side was this rope. A couple of key characteristics are the fact that it has many loops (a potential entanglement hazard for wildlife) and it has gooseneck barnacles on it (a sign that it has been in the water a long time and may have traveled a long distance). In this photo you can see our prototype measuring device/color bars used to determine the size and color of debris objects, along with the familiar COASST ruler and chalkboard. Thanks to all of you for your hard work! Happy COASSTing! 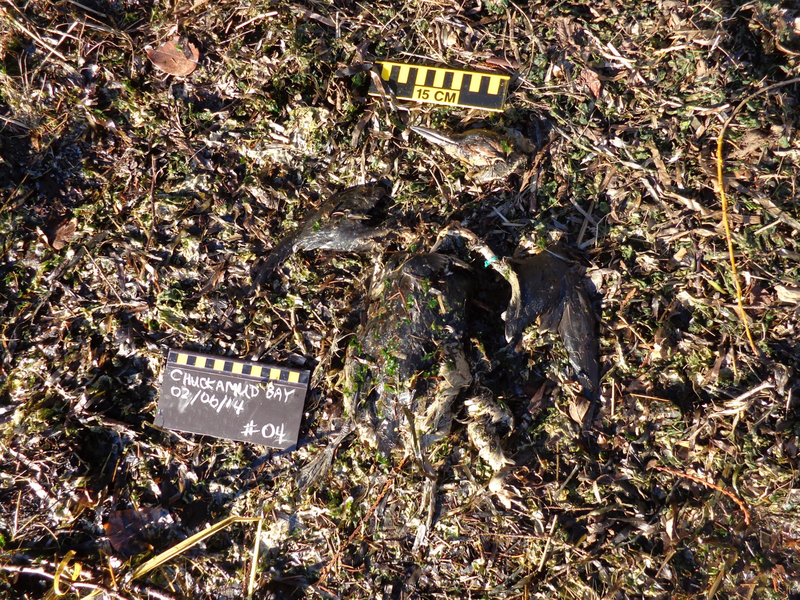 This entry was posted in Uncategorized and tagged Marine Debris, Sea Star, Wreck on July 9, 2014 by coasst. Hope everyone is enjoying the first weeks of summer. As usual, the COASST office is bustling with activity – we have new summer interns, we’re getting ready for three beached bird trainings in July, the marine debris program development is progressing, and we’re now collecting data on sea stars (see below)! Just a heads up for those of you along the California, Oregon, and Washington coast, Brown Pelicans are headed north earlier this year. 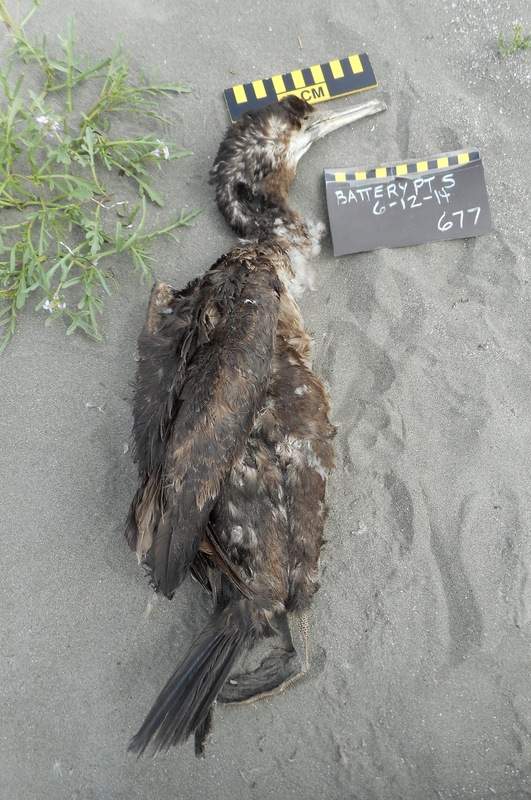 In some years, we’ve seen big spikes of murre chicks around coastal colonies due to Pelican disturbance – be prepared, especially if you survey between Newport and Otter Crest in Oregon North. Let’s take a look at what’s washed in! Ack! Just a wing! But no fear here: if you have the wing key, turn there (that’s what Janet and Carol did), or turn to the wing table! Alaska wing key: Pale, but not white, so select gray (go to Q25). And hey! There’s not much else going on here: no mottled stripe, no dark primary or secondary tips, no bicolored primaries, and the primary tips aren’t white, they’re still gray. 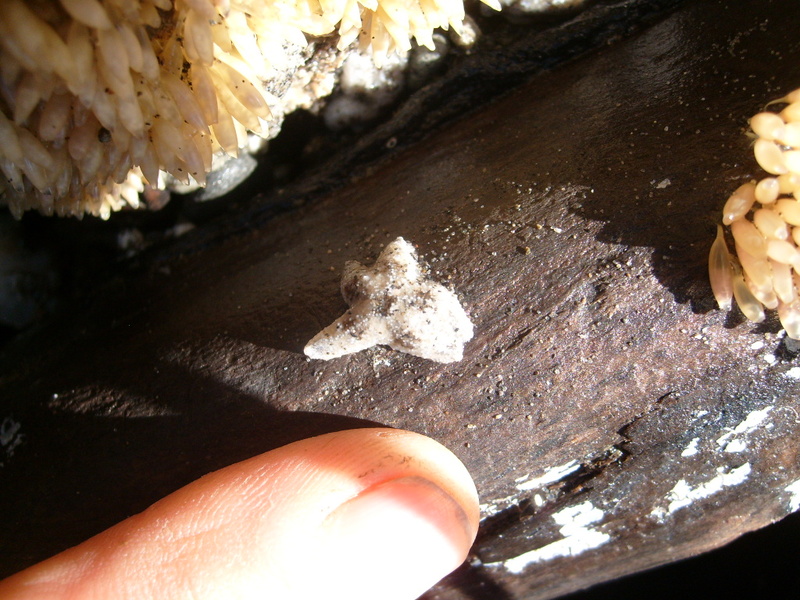 Look close – can you see the tiny white “fingernail”? This has to be a Glaucous-winged Gull (LA6-7). West Coast wing key: Gray mantle, some species with dark tips and/or dark stripes (looking pretty plain here, but still, go to Q10). If upperwing gray, do wingtips contrast? Nope, not that we can see. Check out the longest primary – at least one white fingernail there, so we’re left with Glaucous-winged Gull (LA7-8). Wing table: With our wing chord, we’ll zero in on the “Extra Large” row. Upperwing isn’t dark (those near black hues), it’s gray – turn the page or scan across. Simply gray or gray with white linings or gray with black tips? Well, we can eliminate black tips. We’re left with Heermann’s Gull (LA21-22) or Glaucous-winged Gull (LA7-8). Our wing chord is too large for Heermann’s – Glaucous-winged Gull, final answer. Sure, this didn’t JUST come in, but we pulled this one to show Chris’ detective work started with FINDING the bird, even before the ID. A fine example of a bird hidden (not even buried!) in wrack. All regions: Foot – let’s start there. Three webbed toes and no tiny “minute” toe behind – Albatross or Alcids, but the foot is WAY too small for an albie. Flip to Alcids, AL1. Bill is dark, smooth and featureless – murres or guillemots. No white upperwing patch – not a guillemot and bill is too big for a Thick-billed Murre (a rarer-than-rare option in Puget Sound, but still). Congrats – COMU (AK: AL3-4 West Coast: AL2-3). Ginger figured this out! Flip back to the wing key or wing table. Alaska wing key: Secondaries darker than mantle, so select dark speculum (go to Q17). No patches here (go to Q24). There it is: buffy stripe above and white below speculum. The wing chord is larger than 19cm, so we have a Northern Pintail (rare, not in the AK COASST guide). West Coast wing key: Dark secondaries, go to Q18. Tan stripe above and white stripe below speculum. Definitely larger than a Green-winged Teal – good work – Northern Pintail (WF9-10)! Wing table: Smack in the middle of “Med-Lg,” and we’ll scroll across to patch/speculum. We have few to consider! NOPI (WF9-10), MALL (WF11-12), WWSC (WF 3-4), KIEI-m (WF21-22). Let’s start from the bottom and work our way up! KIEI male – white underwing – ours is mostly gray. All white secondaries, a la WWSC? Nope. Mallard has a purple/blue speculum bordered by white – not quite. Only one has a “greenish brown” speculum – that’s the Northern Pintail (WF9-10). Melissa notes, “dark brown, belly tan mottling.” Let’s go back to the foot key. All regions: Webbed foot (go to Q2), fully webbed (go to Q3), 4 toes, all webbed, Pouchbills (PB1). 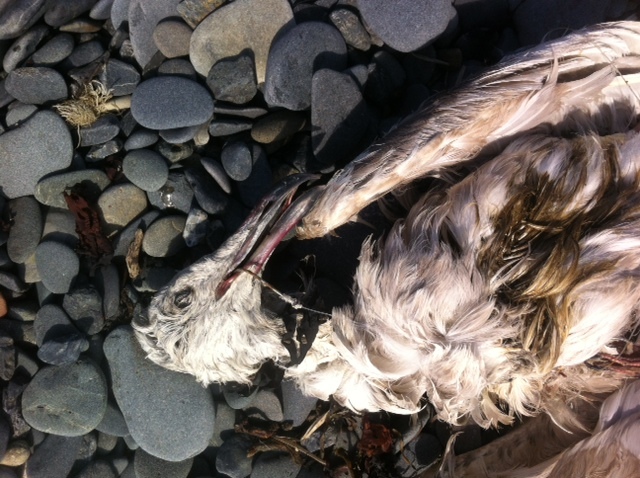 On PB1 we note: NOT a Pelican (wing chord less than 35cm). In Alaska, we can get straight there: tan (or at least not dark) chin. West Coast COASSTers, follow through to pages PB2, PB4, and PB6 to check the measurements of all three cormorants. A bill of 74mm is too big for a Pelagic or Double-crested Cormorant – this is a Brandt’s Cormorant (AK: rare, West Coast: PB2-3). 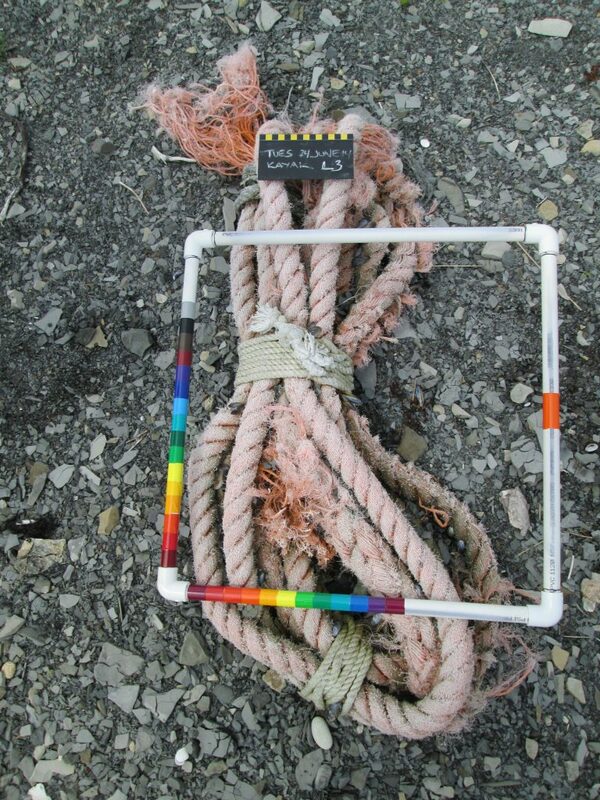 Here’s a buoy that the marine debris team found recently. If you take a close look, you can see the curved pecks from bird bites. Pilot surveys conducted by Marine Debris interns seem to be showing a pattern that’s consistent with research conducted by Gerhard Cadee in the Netherlands. In Cadee’s research, he found bird bite marks on 80% of the foam marine debris he tested! 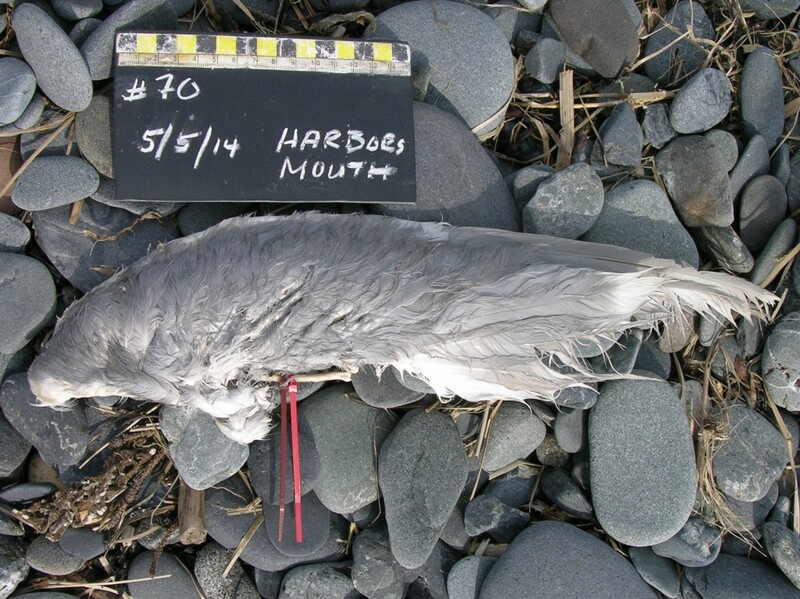 The COASST Marine Debris module will help us understand the degree that birds interact with debris objects. A big THANK YOU to all of you who are helping to collect sea star data. Here’s a photo sent in by Candace, showing sea star wasting disease in ochre sea stars. Sea star wasting disease is currently impacting upwards of 18 species of sea stars throughout the Pacific Coast. COASST is working with Professor Drew Harvell at Cornell University to document sea star wasting disease using a simple protocol. If you live near a coastal area with cobble, rocky bench, or tide pool coastal sites, we’d love your help with this important, time sensitive project. The protocol and data sheet can both be found on the COASST website in the volunteer toolbox. 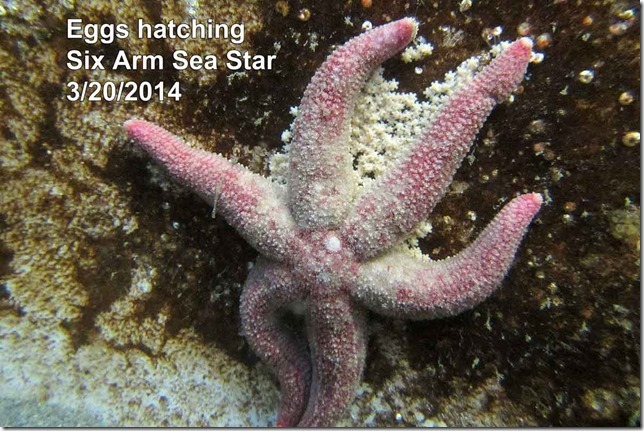 This entry was posted in Uncategorized and tagged Marine Debris, Sea Star on June 30, 2014 by coasst. Thanks, Burt (Kalaloch North and Kalaloch South) for sharing the photo of sea star “babies” at the Feiro Marine Life Center thanks also to Jody and Janis for their in-situ photos from Ruby Beach (part of Olympic National Park). With both of these hitting our inbox at the same time, we wondered, is this just coincidence? When do sea stars reproduce in our coastal waters? Sea Stars are part of the Phylum Echinodermata (literally ”spiny-skinned” in Greek). Male and female sea stars (like Common Murres, only THEY can tell the difference) release sperm and eggs directly into the water column (April-July). The resulting embryos become free-swimming larvae, and after several months metamorphose and settle on substrate as tiny versions of the sea stars we recognize. The sea stars in Burt and Jody and Janis’ photos are settled plankton from last summer. And why do we care? Why are sea stars so important? Well, we need not look far! Just knock on Dr. Bob Paine’s door, University of Washington Biology Professor Emeritus. It’s through years of research on Tatoosh Island that Dr. Paine developed the keystone species hypothesis, a landmark hypothesis in ecology and conservation that describes the importance of (and resulting impact from) predator removal to all other species in an ecological community. So while small, we’re well-served to pay attention to these stars, now and in the future. Learn more about Dr. Paine’s research, including what he sees as the most pressing questions to be answered by future generations in his interview with Hillary, when she was a UW graduate student. This entry was posted in Uncategorized and tagged Sea Star, Washington on March 31, 2014 by coasst.